A lot already came and went, but frozen yogurt is too much of a good thing to be just a food fad. Forget the stormy weather and chill out at Amici's lovely gelateria. Treat your sweet tooth with rows upon rows of various gelato flavors, French macarons, fruit jellies, dolcitas and more. 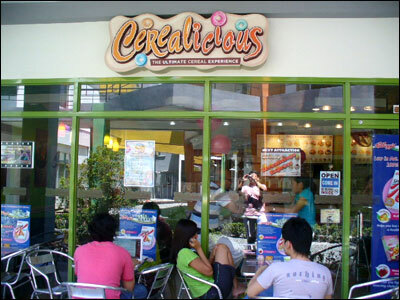 Cerealicious Cafe taught me to consider the place during casual lunches, and more than anything, that coating your food with cereals makes it so much better. A unique twist on the cereal. Tequila Rose, Yakult, malunggay, beer, Bailey's, and bubblegum. At the El Fav Ice Creamery, you’ll find this odd assortment in their ice cream menu. Fruity, cool, and colorful, CaliforniaBerry serves up your favorite 100% nonfat frozen yogurt--and more!